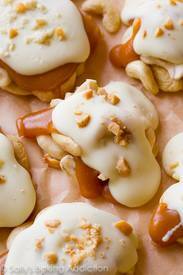 Creamy, chewy, crunchy, and buttery cashew clusters covered in sweet caramel and salted white chocolate. I have… more candy for you. I don’t call it an addiction for nothing. Caramel candy to be exact. In the form of a cluster, similar to a turtle candy but we’ll swap out pecans for buttery cashews and semi-sweet chocolate for creamy white chocolate. All that with a sprinkle of crushed cashew and sea salt on top? No wonder we’re all addicted.